The Swedish Cottage Marionette Theater is a hidden gem of New York City. 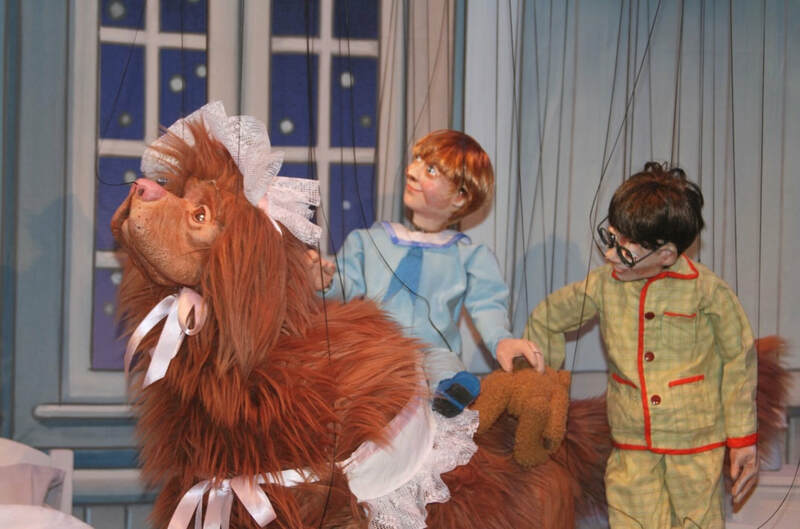 Located in Central Park, the Swedish Cottage Marionette Theater performs a range of amusing puppet plays—most of which are original takes on classic fairy tales. Although ideal for children, the imaginative shows are also fun and enjoyable for adults too. In fact, over the past few years, the theater has become quite popular amongst tourists. The Swedish Cottage Marionette Theater is a beautiful building that is carved and decorated ornately to match the expertly crafted puppets and props inside. The shows typically combine live actors with puppets and music. Due to the impressively affordable cost of the shows $8 for children and $12 for adults—these puppet plays are accessible to practically everyone. The Swedish Cottage building is akin to a wooden cabin. Originally built for the 1876 Centennial Exposition in Philadelphia, Pennsylvania, Frederick Law Omstead—one of the landscapers behind Central Park—was so impressed by the charming cottage that he purchased it and brought it to Central Park in 1877. In 1947 it became a home for puppets when it was used as the base for a troupe of marionette puppeteers who traveled around New York City performing in playgrounds and school auditoriums. A permanent theater that was specifically designed for marionette performances, was constructed inside of the cottage in 1973. Today, the Swedish Cottage Marionette Theater holds the distinction of being the oldest continually operating puppet company in the USA. The Swedish Cottage Marionette Theater is currently a partnership between City of New York Parks & Recreation and City Parks Foundation. Under the direction of the City Parks Foundation the puppet shows currently occur in both the theater and via the City Parks Foundation’s “PuppetMobile” traveling show. 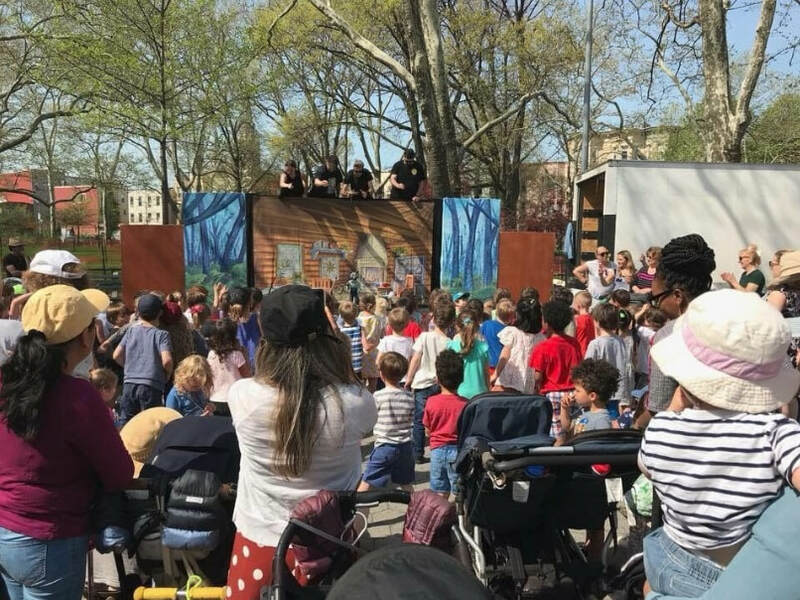 The theater also hosts free puppet-making workshops and performances in NYC neighborhood parks, schools, and recreation centers. For the 2018 season—which runs through October —the PuppetMobile is presenting a new show called “The Big Good Wolf” which is a fun spin on the classic character from “The Three Little Pigs,” “Little Red Riding Hood” and “Goldilocks and the Three Bears.” In this tale, a wolf residing in an enchanted forest must seek the help of “Fairy God Mice” to change from a bad wolf into a good wolf. Bruce Cannon, the Artistic Director of the Swedish Cottage Marionette Theatre, recently discussed this play (that was co-written with Jeff Borkin with music by Daryl Kojak) and more via an exclusive interview. Meagan Meehan (MM): How did you discover your love of puppets and how did that lead you to the Swedish Cottage Marionette Theater? Bruce Cannon (BC): Even though I experienced my first Puppet marionette show as a six or seven-year-old child in Harlem at a department show, I discovered my love for puppetry when I first stepped into the Marionette Theatre in May of 1975. 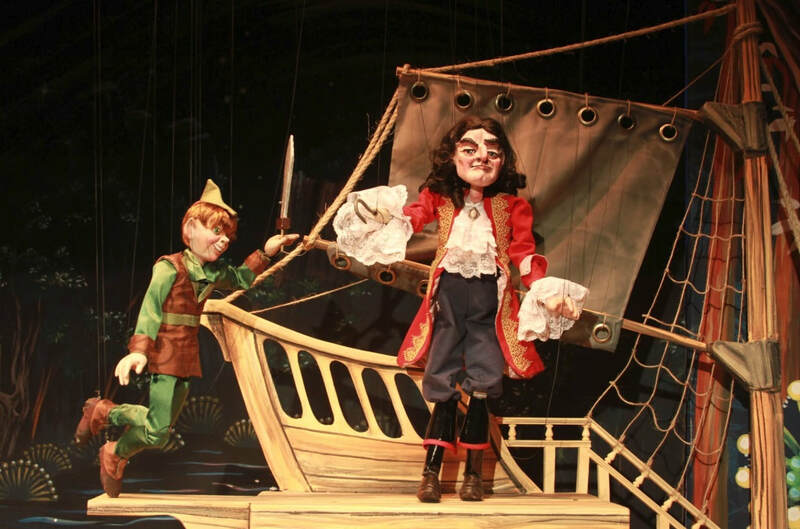 The Show was "THE PETER PAN GAME"
How I came to the Marionette Theatre is a very interesting story. After graduating from the prestigious High School of Music & Art (now LaGuardia High School) in 1974 as a classical Trombone major, I went to Virginia State College. A year later I was back in New York City. It was the beginning of the disco era. I was just hanging out dancing the night away. That could not last too long! My Mother gave me an ultimatum: get a job or return to college. With the party bug and the beat of disco at 19, college was not on my radar. I would pick up on school later. Fortunately, in 1975 there was a federal Job training program (CETA) Comprehensive Education Training Act. It was a program inspired by the WPA program of the 1930's, I was made aware of and accessed the program. With a strike of luck, or fate, I was assigned to City of New York Parks & Recreation. A wonderful supervisor Mary Purcell interviewed me and because of my background in the Arts she invited the director of the Marionette Theatre Larry Aumen into my interview. The next day I was assigned to the Swedish Cottage Marionette Theatre. Through the tutelage of many mentors, at the Swedish Cottage Marionette Theatre much of my work experience during those early years was comparable to master’s classes in performance, marionette construction, theatre craft, management and more. All of my early training and experience culminated in my first production "BOOGIE ALLEY written ,designed, and directed for the Puppet Mobile four years later in 1979. ​ In 1980 "A DISCO FANTASY " would follow at the Marionette Theatre and PuppetMobile Thank God for a superb foundation! It would all come in handy since I became the Director in 1997. A program and position that was only to last 12-24 months has lasted for 43 years and is still going! MM: The Swedish Cottage is a beautiful hidden gem of the city. What about its history most interests you and what do you wish more people knew about it? BC: What interests me most about our history is that the theatre has had a multi-cultured staff from the beginning. In early photos dating back to the forties with our first company we see people of color. The theatre has been multi-cultured ever since with talented employees populating all aspects of its operation. MM: Your puppets and sets are beautiful! Who creates them? BC: Our puppets have been made by many talented puppeteers through the years. Some that stand out are our first director Ascanio Spolidoro, Larry Aumen, Michael Alogna, Nick Coppola, Pady Blackwood, in more recent years Addis Williams and our current puppet builder Doug Strich. Our sets, at the beginning of our history, were done in-house and continued that way through the 1990's. Among our best set designers was Larry Aumen and Jimmy Racioppi. In recent years we have used Hudson Scenery, Kevin Roach and Valarie light who is our current scenic designer. MM: The shows you put on are often derived from classic fairy tales...with a twist! So, who writes the shows and what makes original work successful? MM: Puppet shows are typically regarded as strictly children’s media, but many adults can enjoy the Swedish Cottage offerings too. Do you intentionally create plays that you know will cater to all ages? BC: Although puppet shows are typically for children, we are quite aware that parents and grownups come to our performances too. The goal of creating productions that appeal to the young and old alike was originally championed by Disney. It is a winning formula. MM: You employ actors to work with the puppets and have an array of puppeteers—what sort of training does that take? BC: As far as our Puppeteer's training, I have to first give our need for Marionette Puppetry training some context. Marionette Puppetry is a dying art. Many experienced puppeteers have no training in this genre. A very small percentage of our puppeteers come to us with experience in marionette manipulation. Our puppeteers come to us with backgrounds in many disciplines including acting, dance, clowning, music and the fine arts. I look for talented individuals with an aptitude for this rare performing art form. Beginning with basic walking techniques the Marionette Puppeteer, by the end of the training, would have acquire a vocabulary of marionette movement that can be translate into Marionette Theatre Performance. MM: You also run a program called the “Puppet Mobile” that takes puppets all over NYC parks. So, how did that program start and why do you think it’s been so successful? BC: Before there was Swedish Cottage Marionette Theatre which opened its doors in 1971, there was The PuppetMobile program. The touring company which started in Newtown, Queens, before television quickly became an integral part of NYC 's cultural life. Today with so many more media options for children there is still a very good appetite for live marionette puppet theatre. MM: Your newest show is called “The Big Good Wolf.” What’s it about and why do you think the story will be appealing to audiences? BC: “The Big Good Wolf” is a mash-up of two stories, “Goldilocks and the Three Bears” and “Little Red Riding Hood.” Add cameos by the Three Pigs and the Three Blind Mice, reminiscent of the Supremes and you have a very entertaining puppet show! The story is different but easy to follow. All this is in keeping with our tradition of adding a twist to original fairytales! MM: What are your biggest hopes for the future of both the Puppet Mobile program and the Swedish Cottage? BC: My biggest hopes for the PuppetMobile and Swedish Cottage Marionette Theatre is that we continue to create world class marionette theatre and that we continue to be relevant and an important part of the cultural life of NYC and the world. I also hope that we continue to expand our constituency through marketing, internet etc., without excluding a part of our base which includes inner-city children. BC: It is important to know that the PuppetMobile and the Swedish Cottage Marionette Theatre started through the efforts of creative and industrious puppeteer/recreation professionals/ civil servants working for City of New York Parks and Recreation. Having stated that fact, it is the City Parks Foundation that's responsible for the renaissance of Puppet Mobile and Swedish Cottage Marionette theatre. central to the theatre's development and growth. We are also now an Historic House under the auspices of the Historic House Trust. Our Historic Swedish Cottage home base has a remarkable history of its own. We have an important space to house the amazing puppeteers, the marionette theatre stage and the puppet mobile’s history. ​just south of the Delacorte Theater. Anyone who is interested in attending a performance (or simply finding out more about the theater) should visit the official website. Click the names to learn more about the Swedish Cottage Marionette Theatre, PuppetMobile, and the overall SummerStage programming.